Paddle boarding in Seattle WA is a unique, one of a kind experience. The city is rich with history and culture and offers a blend of urban living while still being surrounded by stunning views of nature and wildlife. From the water is a great way to take in some of the historic sights. Seattle and the surrounding areas has plenty of places suitable for paddle boarders of various skill levels, from beginner to advanced. 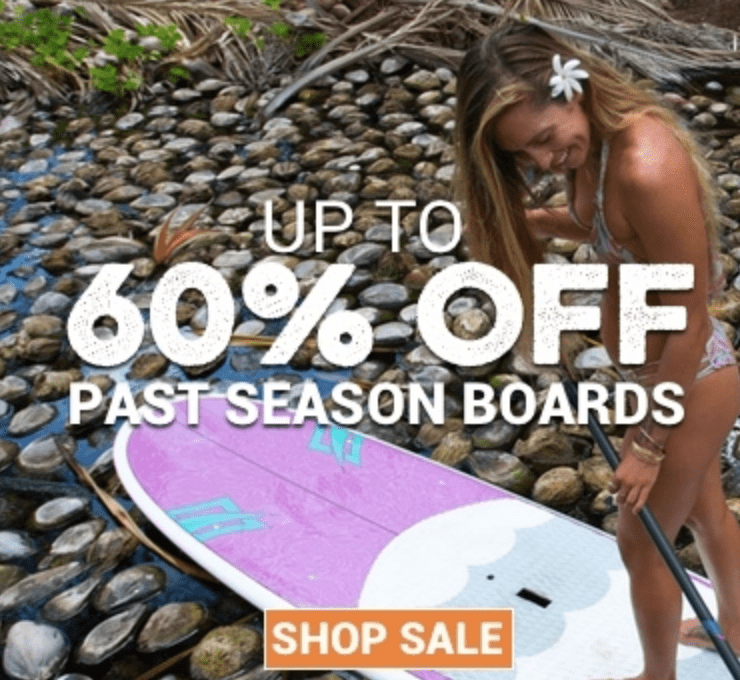 So, if you’re in the city and looking for some of the best places to get your board out onto the water, we’ve got you covered. We did the research and created a list to help you spend less time finding the perfect spot, and more time enjoying all that Seattle waters have to offer. 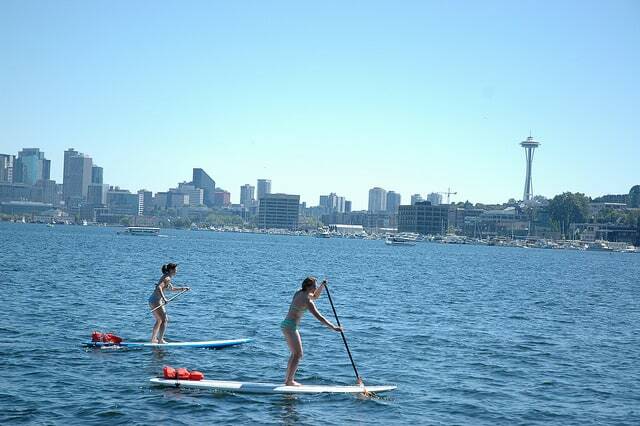 Located in West Seattle, you can enjoy a view of the skyline while you paddle. Alki Beach is popular among paddle boarders and is a great place to spend the day either out on the water or relaxing on the beach. After you’ve worked up an appetite, you can enjoy a meal or drink at one of the restaurants located within walking distance. While out on the water you can enjoy paddling past Alki Point Lighthouse, a still functioning lighthouse used by the Coast Guard. From the beach, you can paddle to Lincoln Park, one of the largest parks in Seattle and home to a unique primary forest, habitat to wildlife such as the barred owl. The wind can change quickly here, and wetsuits are recommended. Located in urban Seattle, just five minutes from downtown, Green Lake offers over 200 acres of water warmer than any you’ll find in the coastal oceans. A perfect lake for paddle boarders of every skill. The lush park surrounding the lake is excellent for getting a respite from the sun. The park is very popular during the summer and on the weekends which can make parking a challenge. Rental paddle boards are available at the Greenlake Boathouse. Lake Washington is a freshwater lake and makes a great place for beginners with its calm waters. Because there are no worries about tides, it’s a great place for families who want to stand up paddleboard together. From several of the lake’s beaches, you have awe-inspiring views of Mount Rainier. If you left your board at home, there are rentals nearby. Juanita Beach Park even offers paddle board yoga for those adventurous enough to give it a try. Be cautious of strong winds that can create dangerous conditions for those out on the lake. The lake is also a great place to swim during the summer. Suggested beaches for standup paddle boarding are Matthews Beach and Juanita Beach. Featuring one of the biggest bays in the state, Shilshole Bay sits in a welcoming community and offers some of the best views of Seattle’s natural landscape. Golden Gardens features a sandy beach with views of the mountains and the Puget Sound, making it a favorite among locals. At low tide, you can observe sea life up close while paddling. Be mindful of the seals, and strong winds that can blow through the locks creating wind tunnels and riptides. Shilshole Bay is located in Ballard an excellent place for shopping, music and dining, it’s also home to the Nordic Heritage Museum. Close to the heart of downtown Seattle, and loved by both tourists and locals. Lake Union offers sweeping views of the city, you can spot the Space Needle, Capitol Hill and Queen Anne. This location is a great option for paddle boarders who don’t have their own equipment since there are several businesses nearby that offer rental kayaks and SUP rentals. It is recommended to arrive earlier in the day if you are renting, so you don’t have to wait. There are several restaurants located on the water, The Little Water Cantina is a great informal place to relax, and get a bite to eat after a long day on your board. Lake Union is popular for watercraft, so be attentive while paddling. Suggested launch areas are the Sunnyside boat ramp located to the east of Gas Works Park. For paddle boarders looking to sightsee in one of Seattle’s famous neighborhoods, take the Fremont Cut that leads off of Lake Union. Passing through Gas Works Park, you can see the former gasification plant. The park is a great place to rest and maybe take a few pictures, or watch seaplanes take off. Also along the route is Google’s Seattle campus. Located nearby are several restaurants and coffee shops for you to enjoy after your excursion. Recommended launch areas are the 14th Ave Boat Ramp. For those who want to relax and see plenty of wildlife, Washington Park Arboretum with its still-water refuge is a perfect fit. Occupying 230 acres on Lake Washington near the University District, this tranquil park offers narrow waterways, cattails, water lilies and trees that make you feel like you’ve transported into a tropical forest. From your board, you’ll catch glimpses of the University of Washington Campus and Union Bay. The park also boasts a Japanese garden near the southern end. If you park at the Graham Visitors Center, you can quickly launch from Duck Bay. Seattle’s largest park, Discovery Park is a great place to stand up paddle board while observing the park’s marine life. You can also check out the West Point Lighthouse, which you can conveniently launch from as well. The park is located between Elliott Bay and Shilsole Bay, giving you great views including that of Mount Rainier. If you are going to standup paddleboard in Seattle, be safe, always check the conditions of the winds and tides before heading out, and be vigilant of sudden changes in weather as an unexpected storm could be rolling in. Algae can be harmful, so be sure to check the local park websites and signage on location for any warnings. Always wear the recommended attire for the weather, particularly at Alki Beach, where the water typically varies between 40 and 55 degrees Fahrenheit depending on the season. Many of these areas share the water with large vessels and fast watercraft, so give yourself plenty of time to safely get out of their way. We hope you enjoyed our article here at SUP Boards Review. Please feel free to leave any questions or additional thoughts below.